Fitting that one day before day one of the new year, it’s a book called One Day that I’m reviewing. Not so fitting is how long it took me to read it; I’ll give you a clue, it wasn’t one day. 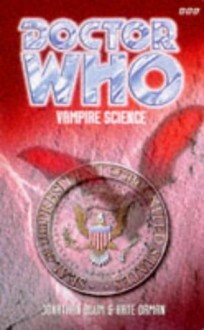 No, I was off and on with this one, taking repeated breathers with other books. You could say I’m starting to become a bit ADD in my reading habits. I’ll have a half dozen books already checked out, and due soon, yet then they’ll get another book in for me which’ll be given priority, and then yet another will follow suit, and before you know it I still have a half dozen books left and not nearly enough time to read them, making me have to renew them all. After that, this whole process may or may not happen all over again. Sometimes, I never do finish the other book(s); Different Seasons still remains only partially completed on my shelf, one of the few remaining books I own yet haven’t completed. Luckily, the delays I subjected One Day to weren’t so bad; there’ve been books I waited so long before getting back to that I had to start all over again, but I had no such difficulties with One Day, owing in part to having seen the stellar (in my opinion and seemingly no one else’s) film adaptation, one of only four (or is it five? I’d have to go back and check to be sure) movies to ever make me cry. 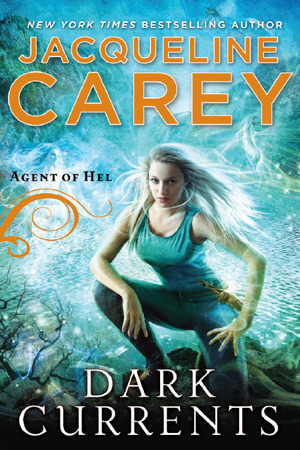 The book had nowhere near that affect on me, which might have a lot to do with the timing; I watched the movie not long after a rough breakup, whereas the book didn’t have that working in its favor, adding more weight to the emotional punches it certainly doesn’t pull. As with many others this year, I’ll have to rewatch the movie to see whether it’s a matter of shifting tastes or something else altogether. That being said, I’d like to say my preferring the movie by a wide margin is a result of it feeling like a scrapbook come to life, and the book seeming to dwell more on the moments, not so much an issue with the good, but bothersome during the bad; neither is particularly long, but the book feels noticeably longer. This is all rather vague, I know, but it’s all I have for you, since I’m going to have to cheat yet again and say I’ll just need to revisit this once I give the movie another go. 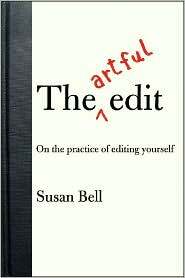 I’ve had The Artful Edit: On the Practice of Editing Yourself (2007) by Susan Bell on my to-read list ever since I decided to try NaNoWriMo about seven months ago. I can’t remember how I originally found The Artful Edit, but I quickly decided to postpone reading it until after I had actually written something to edit. And that’s how I came to be reading it in December. 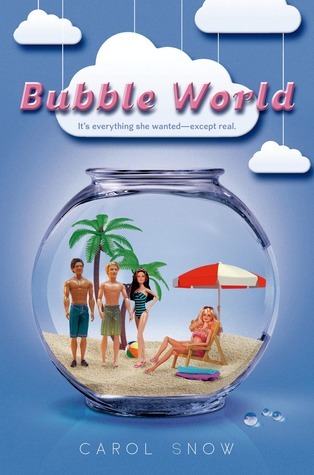 Susan Bell taught a New York’s New School graduate writing class in self-editing, and I think the idea for the book came from that class. Bell separates the book into five separate chapters: one about stepping away from your work to gain perspective; one focused on macro-editing; the next on micro-editing; a “master class” delving into editing for different artists (i.e. photography); and finally a brief history on editing and how it’s changed throughout the years. Although this book was more school learnin’ than entertainment, I found it generally interesting and helpful. The chapters end with a quick summation of the suggestions discussed in the chapter, and I think I’ll keep those for further reference. The last chapter dragged, and was more challenging to push through, although Bell still managed to relate it back to our own works. Unlike No Plot? No Problem!, which got me started on the whole NaNoWriMo adventure, The Artful Edit is a little more intimidating. Instead of encouraging laypeople that anyone can do it, Bell dissects great literary texts and quotes and discusses countless famous authors (only some of whom I actually knew). I definitely got the sense that this book was for “real” writers. Part of me felt desperately out of my league. However, Bell also had a number of famous authors describe their own editing processes, which turned out to be quite varied. Not only was this fascinating, but it was freeing to see that what works depends on who you are and how you work. One of the main teaching elements of The Artful Edit was the use of The Great Gatsby. Bell liberally used quotes from earlier versions with comparisons to the final draft, as well as some enlightening correspondence between Fitzgerald and his editor to illustrate various aspects of writing and editing. The examples were helpful as illustrations, but it was also fascinating to see the building of something so famous. I’m certainly not looking to write a great classic: an understandable story that I let some of my friends read would count as a major accomplishment, but it was inspiring to see how much difference editing can make in a text. I haven’t even looked at my first draft since the end of November, but reading this book has me excited to get back into it. To see more of my reviews, visit my blog here. Zel lives in a remote cottage in the mountains with Mother. The only time she sees other people is twice a year, when they go to Market in the nearest town, quite some distance away. While Zel finds the people, bustle and excitement of town life exhilarating, Mother insists that they have everything that they need in their little home, and warns her daughter away from strangers. Yet Zel dreams of a different life, of some day having a husband and children and a home of her own. Just before her thirteenth birthday, she meets a beautiful young man with a spirited horse, and she can’t seem to get him out of her mind. Konrad, the young count, is also unable to forget the young girl he met in the marketplace, and who seemed to almost magically calm his horse. Even when his parents try to arrange suitable marriages for him with lovely young maidens, he refuses, riding around the countryside trying to find out where the mysterious Zel can be found. 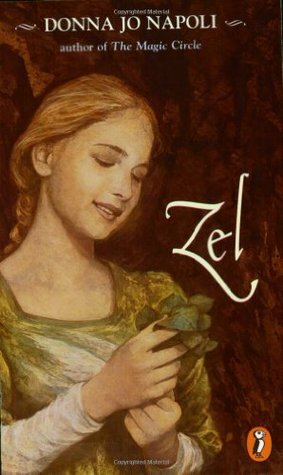 Mother grows anxious and worried when Zel mentions the pretty young man, and claims that there are bad people out there who want to harm them. She takes Zel to an abandoned tower, a fair distance from even their remote cottage, and before Zel realises entirely what is going on, she is trapped high above ground, with no way of escaping, with Mother on the ground, saying she will keep the bad people away. Zel’s hair starts growing at a furious rate, until she can pull Mother in and out of the tower with it. Lonely and distressed, the young girl dreams about the young man, and tries to while away the months and years of her imprisonment. She’s fairly sure she’s gone entirely mad, when one day there is a call for her to let down her hair, and count Konrad climbs in instead of Mother. 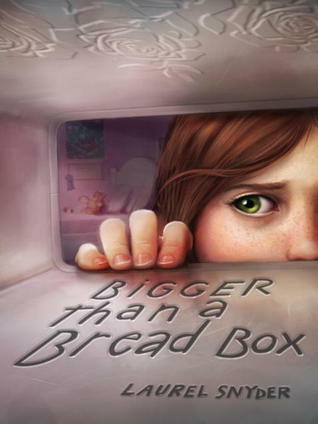 This is a short read, and an interesting retelling of the story of Rapunzel. Some of the chapters are narrated in third person, and show Zel and Konrad’s point of views. The ones from Mother’s POV are in first person, making her account the most personal of the three, and making the reader empathise more with her, even as she’s the nominal villain of the story. The witch who forced a young couple to give away their child in return for the Rapunzel salad they had stolen from her garden, who locks the girl in a tall tower to keep her away from all others – Mother is more than this here. A frustrated and intelligent woman given a tempting choice, incredible power over all growing things in return for a soul she might not even believe she has, who finds herself barren and alone, willing to do anything to gain a child, and who loves that child so much that she’s determined to do anything to keep her, even if it means making the girl possibly hate her. Mother can’t bear to lose her beloved daughter, but when it becomes clear that she may have caused her more harm than good, she makes the ultimate sacrifice to ensure her daughter’s eventual happiness.